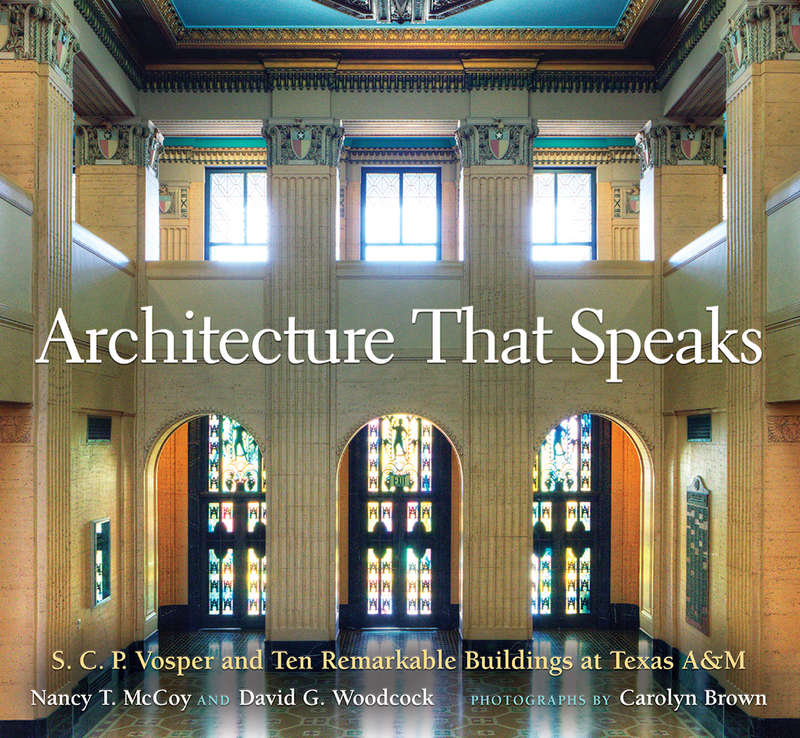 JJoin authors Nancy McCoy and David Woodcock for a book signing of their new book, Architecture That Speaks: S. C. P. Vosper and Ten Remarkable Buildings at Texas A&M. The signing will be held from 2-4 p.m. on Saturday, November 11 at Bishop’s Palace, 1402 Broadway. When the A&M College of Texas opened its doors in 1876, its early buildings followed a Victorian architectural style. Classical architecture came to the campus with the Academic Building, after the 1912 fire that destroyed Old Main. Subsequent buildings generally followed this neoclassical path, but the growth of the campus in the Depression era saw the addition of an extraordinary group of buildings, sited in accordance with a master plan developed by college architect F. E. Giesecke and designed by S. C. P. Vosper, each of whom also held faculty positions in the first architecture program at a state college in Texas. The buildings designed by Vosper are arguably the finest buildings on the campus, uniquely expressive of the agricultural and mechanical origins of the university; they delight the senses with color, sculpture, and wit. Nancy T. McCoy and David G. Woodcock, distinguished preservation architects and scholars, review the history of Texas A&M campus architecture and provide in-depth coverage of Vosper and his legacy. Illustrated by the sumptuous photography of Carolyn Brown, Architecture That Speaks concludes with observations on recent approaches toward the reuse and rehabilitation of campus heritage architecture and a view to the future, as plans evolve for further development of the campus that maintains a respect for both strategic vision and historical heritage. NANCY T. McCOY, FAIA, FAPT, is an award-winning preservation architect with Quimby McCoy Preservation Architecture in Dallas, Texas. She has worked on National Historic Landmarks, including Kansas City’s Union Station and Fair Park in Dallas, and on some of Vosper’s buildings at Texas A&M University. DAVID G. WOODCOCK, FAIA, FSA, FAPT, is professor emeritus of architecture and director emeritus of the Center for Heritage Conservation at Texas A&M University. He has received the Clara Driscoll Award from Preservation Texas and lifetime achievement awards from the National Council for Preservation Education and the Association for Preservation Technology International. CAROLYN BROWN began photographing ancient architecture while living in Cairo, Egypt, and as a Texan has traveled throughout Mexico photographing pre-Hispanic and Vice Regal architecture. An architectural and fine arts photographer in Dallas, Texas, specializing in preservation projects, she is the photographer for Caddo: Visions of a Southern Cypress Lake.